“Goodbye poorly air-conditioned Aragon, hello Navy Pier! Taste of the Nation was even better than last year and the weather couldn’t have been more lovely as the night ended with guests happily stuffed and mesmerized by fireworks. Plus, this year the desserts were sprinkled throughout the main floor instead of tucked away on a separate level, so it was easy to enjoy sweets interspersed with the savory offerings. 1) Sprout’s Fig Thing With Cookie— they threw everything from bacon to frisee and red wine blueberry jam on a plate with a thyme shortbread cookie and somehow this salad-desperately-wishing-it-were-a-dessert worked. 2) Boka’s Criollo Chocolate Creméux with Yogurt Orange Blossom Water & Michigan Raspberries – Kady Yon’s swan song at Boka before she heads to Pump Room. She’ll be sorely missed. 3) MK’s Kumamoto Oyster & Heirloom Tomato Gazpacho Shooter – never had an oyster like this before, but the briny flavor was perfect with gazpacho. 4) Andrew Schicker of GT Fish & Oyster’s Fresh Grape Sidecar with Pierre Ferrand, Combier, lemon and grapes. Schicker didn’t add any sugar to sweeten this drink, instead using muddled grapes for a perfectly light and fruity refreshment. Tru’s Meyer Lemon Gelée with fennel cream and black olive was the only dish served in a glass as opposed to plastic, and the tart lemon made this the perfect intermezzo between heavier courses. Moto’s ACME “camping dessert” may have really been just an interesting chocolate truffle with a liquid graham cracker center, but Ben Roche lit the dessert on fire. Gimmicky? Perhaps, but impressive nevertheless. Roche said he experimented for more than a month to come up with the perfect dehydrated marshmallow fuse for this s’mores bomb. MarketHouse’s Scott Walton was making it rain black gold, generously shaving winter truffle atop his Lobster and Smoked Corn ensemble. Sweet corn and watermelon dishes popped up everywhere and began running together in my mind after a few too many cocktails and more than 50 dishes. I’m not complaining though. A refreshingly simple watermelon salad is so good, I don’t mind having it a half-dozen times. 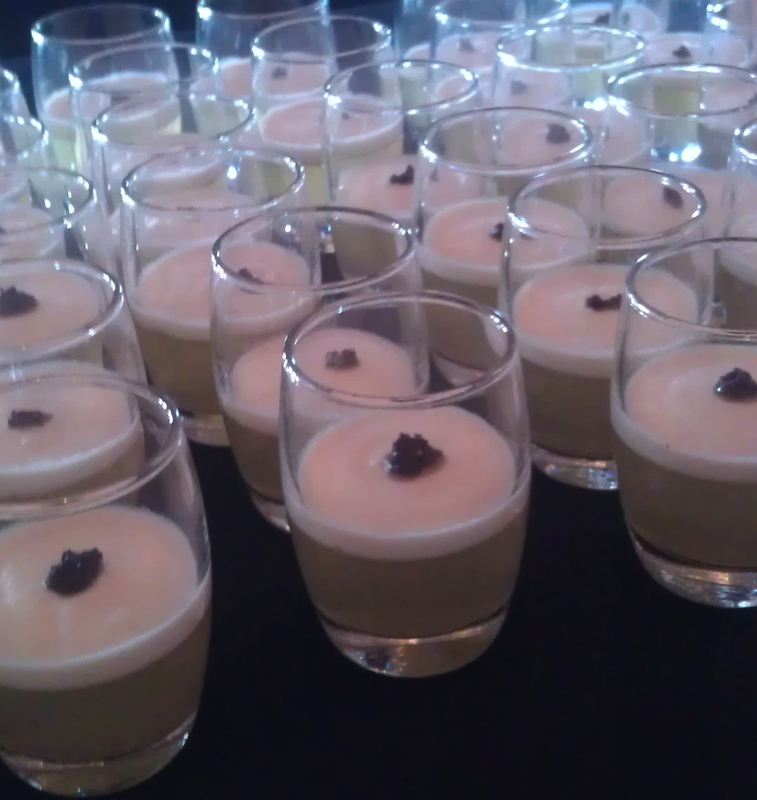 With desserts, there were too many half-hearted crémeuxs, puddings and panna cottas to count. And everyone from Cafe Spiaggia to Sunday Dinner to Girl & the Goat were serving caponata.